Our range of products include rolling contact servo stabilizer. 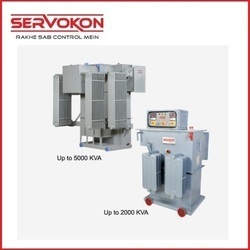 Servokon is a multi- product and service organization engaged in manufacturing, supplying, erecting, testing and commissioning of Rolling contact servo Stabilizer. Our mission is to compete in the world market through excellent product quality & incorporation of designs that match international requirements. It helps in reducing the breakdown of electrical equipment. One can derive power saving by using this automatic rolling contact type voltage regulator. It is important to improve your power factor in case of high voltage. Looking for “Rolling Contact Type Servo Voltage Regulator”?